The Felician Sisters' project made us of an existing building and achieved a high level of environmental performance. In the late 1990s, the Felician Sisters – an order of Catholic nuns – in Coraopolis, Pennsylvania had some hard choices to make. They had an aging population of sisters in residence, whose average age was 77. Most of these sisters had spent the greater part of their lifetimes in service to their order. They had two aging buildings, a 1960s infirmary and a 1930s "Motherhouse." 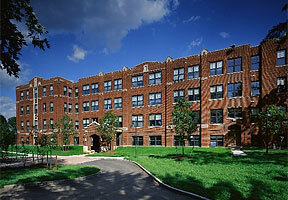 Some sisters lived in each building, and the Motherhouse also housed a 300-student high school - Our Lady of the Sacred Heart. The size of their order was declining. Their income was declining. Their expenses were rising. "We had to figure out what was best for our order, our sisters and our students," says Sister Chris, one of the order’s leaders. "Was it incremental change or fundamental change? "So we hired a woman to help us with our planning, a very good facilitator. She walked us through a range of options. We could sell our whole facility and move away to somewhere bought or built. We could just fix up the dormitory or just fix up the school - remember, the school was thriving, and we had a responsibility to those students. At a bare minimum, we could just fix up the bathrooms in the dormitory. "We worked on this within our provincial administration team, which is six of us. And after much deliberation, our idea was to concentrate on a complete "makeover" of the motherhouse…have all the sisters live there, and expand the school. We decided to put it to a vote by all 110 sisters in the province. They got excited by the notion of the high school and the dormitory sharing the 1932 building." The result is a building in which the sisters live within ten "household clusters" of bedrooms and bathrooms around a common dining room, kitchen and living room, providing the sisters with a wonderful combination of privacy and community and making it far easier to provide them with assistance when they require it. In addition, the school has the latest technology, updated classrooms, science facilities, a new performing arts space and library. The school expanded and is now fully enrolled. And what about green aspects? They are many, from major to minor, from systems to materials. The building is heavily insulated, including high performance glazing on the windows. There is an emphasis on natural lighting throughout. Rooms are equipped sensors that adjust lighting levels depending on the level of natural light and occupancy. Solar hot water panels collect the energy for the building's domestic hot water. Many of the existing building's materials were re-used (for both environmental and cultural reasons). New materials were selected for their recycled content and low emissions footprint, and for having been sustainably harvested. Outside, lawns were allowed to return to meadows, reducing the need for watering and the use of chemical herbicides. Rainwater is collected for irrigation and the building's evaporative cooler. That's a big investment in green building strategies and technologies! "Yes," laughs Sister Chris. "And you have to remember that greenness was not something that was on our radar as we did our planning or made our decision." How and when, then, did this become a green project? "It was shortly after we had hired our architect but not yet our builder, I happened to see a newspaper article about a Pittsburgh food bank storage facility that had just been built that had gotten LEED certification. And as I read this article, which explained what LEED was about and what kinds of things this building had been able to achieve, I had what you could call an epiphany…this is what we could do, what we should do, it's central to what our values are and the ways in which we want to be a part of the larger community. "So I made enough copies of the article for the administrative team and brought them to our next meeting with Laura Nettleton, our architect. I gave everyone a copy, and then I spoke about it. Well, you should have seen the smile on Laura's face…it could have lit up the room. Happily, we work by consensus all the time around here, and so right at that meeting we committed ourselves to going green. 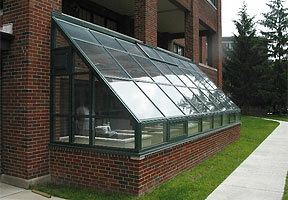 The Felician Sisters integrated a number of green features into their existing building, such as this greenhouse that brought plants and more natural light into the building interior. "The next critical step was to hire a contractor. We had a large budget, and so every contractor in the Pittsburgh area was interested in our project. We interviewed four or five firms. And we asked all of them what their green experience was. We heard some assertions we just didn't believe. But there was this smaller firm that really had done its homework…they made it clear that they hadn't done green stuff before, but they were committed to this…and they had many specific things they were recommending. "We were stumped. We had a strong "gut" feeling about Ernie Sota and his firm, but he was small and there was some risk involved because of his lack of green building experience. Our second round of talks with him was less about green than it was about could he scale up to a project of this size. He convinced us he could, and we believed him. Well, it was meant to be, because he did a great job for us, guiding us through many decisions and delivering what he said he would deliver. As we budgeted, we decided consistently to put more dollars in the infrastructure and energy systems of the building and less into finishes. Sometimes Laura would question us about such decisions, and we'd say with mock exasperation, "But Laura…we're Franciscans! We like to keep it simple." Looking back on the project, what was the best thing that happened? "For me, says Sister Chris, "the best thing about our project was something very personal. It brought a new phase of my life into being. I really re-examined how a life of faith ought to focus on care of God's creation, and I saw how what we were doing with our building was central and important to this. So now a significant part of my life is spreading the gospel of green!" What would you have done differently? "We knew the outcome of this project was going to be a major change in the way our sisters lived. We thought it would be for the better! But a big change nonetheless. So we hired a sister from outside our community to be a facilitator with us around the subject of dealing with change. And I just feel that this was something we ought to have done for our leadership team as well as our wider community of sisters." What was the project's most difficult aspect? "It had to do with consolidating the dormitory (which, with a population of aging, retired sisters, has many of the aspects of a hospital) with the school. But that's turned out to be a plus, because now we have more intergenerational activities, which energizes the sisters on the one hand, and provides the kids with the sort of kind wisdom that can really be meaningful when you're a teenager." What would do differently if starting today? "That’s easy--go green from day one, and educate everybody about this dimension of things earlier." Any advice for those about to build green? "That's easy, too. Going green does not have to mean going more expensive. Like with energy, we looked hard at geo-thermal, but ended up placing a large rack of solar panels on our big flat roof. It just made more sense for us. The thing to do is to match the reality of technologies and expense to your organization's experience and needs. It's not a contest! Be as green as you can and want to be. And remember to build green is only part of it. You've also got to live green!"